Half of Americans fear that terrorists might cripple American utilities such as electric, transportation and water systems, or its banks and major corporations through cyber-attacks, according to a new survey conducted just days before an accidental blackout cascaded across northern America and eastern Canada. Some 49% of Americans they were afraid of cyber-assaults on key parts of the U.S. business sector and more than half of Internet users say this is a concern for them. A significant gender gap showed up in the data, as women (58%) were more likely to express fear than men (47%). Asked about their concern about their own safety, a third of the respondents (34%) said they worried they or someone in their family might be a victim of a terror attack – and, again, women (45%) were significantly more likely to express concern than men (28%). The poll of 1,001 adults, conducted from Aug. 5-11, also found that 71% Americans are at least fairly confident the federal government would provide them with sufficient information in the event of another terrorist attack. Yet, a significant plurality does not think the current alert system is good enough. Some 57% of respondents said the government’s color-coded warning system provides useful information, while 38% said the system does not provide useful insights into the level of threat the nation faces. The survey was taken by Federal Computer Week magazine and the Pew Internet & American Life Project to assess public sentiment about America’s emergency preparedness and warning systems two years after the 9/11 terror attacks. The dates of the survey happened to come just before the blackout. While most people would turn first to television to get their information, the recent blackout made clear that multiple alert systems are needed to tell people quickly what is happening. 22% of all American adults (including 36% of those ages 18-29) want a warning system created on cell phones and pagers. Blacks (32%) were also especially interested in getting alerts through cell phones or pagers. 21% of Internet users (21%) said they would also like to get alerts through email. 57% of Americans said they would turn to television first to get information, in the event of another terror attack. Another 15% would turn to radio and 9% would consult news organization or government Web sites. Even Internet users would turn to television first and radio second. Still, 34% would use Web sites as their primary or secondary source of news. Still, government Web sites are about the last place Americans would turn to get information – about 3%. 56% of all Americans believe the government should be able to get information from American corporations about their vulnerabilities to cyber-attacks. Some companies have resisted providing such information for fear it might fall into competitors’ hands or affect stock prices. In the table below, we show the responses to the question of what sources online Americans would use if an emergency occurred in their community. Not surprisingly, the young (those ages18-29) are the most likely to say that the Internet would be a key news source for them in an emergency situation. More than half those in that age bracket would go to Web sites as one of their primary or secondary sources of information. In addition, 21% of Internet users say they would like an alert system that notified Americans of terrorist attacks via email. Again, the young are vastly more likely to be interested in email notification than older Americans. Furthermore, 22% of all Americans and 24% of Internet users say they think notification through cell phones and pagers is a good idea. 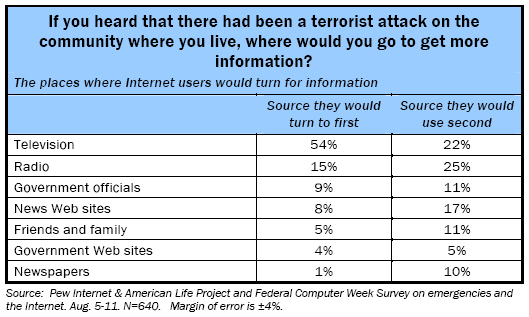 About one in six Internet users (16%) say they have been to government Web sites for information about how to protect themselves in case of another terrorist attack. Of those who have been to sites such as http://www.ready.gov/, the Department of Homeland Security’s citizen-oriented site. Women, parents, and those in their early 20s are the most likely to have done this. Of those who have visited such sites, 13% said they found a great deal of information, 57% said they found some information, 21% said they found a little information, and 8% said they found not much information at all. Some 57% of all Americans said the system provides useful information, while 36% say it does not provide useful information. The system has been criticized by some local officials and law enforcement personnel as too vague to be very useful. Women and young Americans are the most likely to salute the system. About the Pew Internet & American Life Project: The Project is a non-profit, non-partisan research center fully funded by the Pew Charitable Trusts to explore the social impact of the Internet. Its research focuses on such areas as how Internet use affects families, communities, health care, education, civic and political life, and the workplace. It also monitors the activities Americans pursue online and Americans’ attitudes about public policy issues related to technology. About Federal Computer Week magazine: Federal Computer Week is a weekly technology magazine that covers the federal government and information technology, including homeland security. It is published by FCW Media Group, which also produces e-government conferences.